Whether you are new to Huston-Tillotson or a longtime friend of the university, you know that our outstanding students and faculty are the heart and soul of our school community. But we cannot do it alone; we greatly depend on the support of the entire Ram Family to continually strengthen our school. A gift to the Annual Fund of $5,000 or more closes the gap between tuition and the true cost of educating students with the most financial need. We are striving for full support from our alumni and friends to make a Huston-Tillotson University education accessible to students from all backgrounds. And that is why we ask that if you make only one gift to Huston-Tillotson each year, please support the Ram Annual Fund, first! 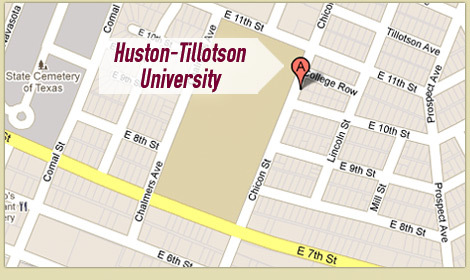 Like most independent schools, Huston-Tillotson University tuition does not cover the total expense of educating a student and providing enhanced academic, athletic and fine arts programs. A gift to the Ram Annual Fund of $5,000 or more closes the gap between tuition and the true cost of educating students with the most financial need. 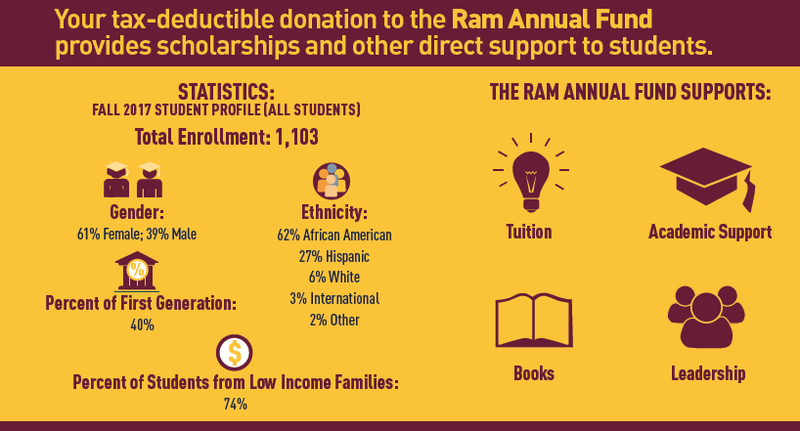 When the full school community rallies together to support the Ram Annual Fund, we are able to fulfill our historic mission and vision of providing a diverse study body with access to a Huston-Tillotson education. At our core, Huston-Tillotson University seeks to develop students with sharp minds, great and humble hearts, and strong spirits. We are a community of smart, talented, focused individuals who are raised up and supported by the full school community. Please help us achieve this important mission by joining with other members of our community to support the Ram Annual Fund. Your participation really does matter. We are grateful for your ongoing and generous support. Thank you! Gifts to Huston-Tillotson University are tax deductible, as allowed by law. Many employers sponsor matching gift programs and will match any charitable gift made by their employees. Give online by credit card. If you have problems with the credit card transaction processing, contact Travis Henry, (512)505-3076 or tchenry@htu.edu. Gifts of appreciated securities and stock can be very beneficial — both to you and to Huston-Tillotson University. You may receive an income-tax deduction equal to the fair market value of the securities, as well as reduce or eliminate capital gains taxes. To facilitate your gift transfer, please contact Travis Henry, Information and Gift Processing Specialist, at 512.505.3076. Please notify Travis Henry, Information and Gift Processing Specialist, at Huston-Tillotson of your gift, including the name of the stock and the number of shares you are transferring.